We are open-minded about trying new things to eat so when they included a pomegranate – cool. I enjoyed pomegranate, raisin, and walnut oatmeal I invented for myself. Four seconds later my mouth twisted sideways and my eyelids popped wide open as the astringent after-effect surprised my mouth. It didn’t stop me from eating half of the fruit, but I ate it slow and in tiny bites, my eyes squinting as I waited for the tannic pucker. Persimmons do a chemical number on mouth cells! How stuff looks is seldom as important as how it tastes or serves or works or feels. 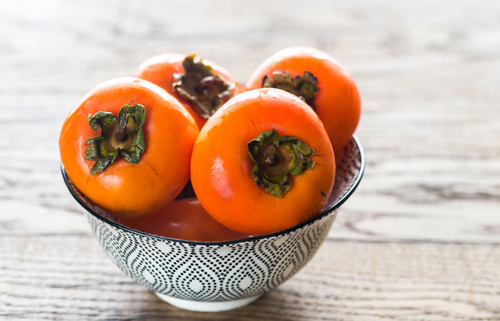 The truth of Persimmons is that how something LOOKS seldom tells the whole story – and this is a truth to deal with when living any life, especially a frugal one. Most of us care about how our houses and families look. Having hopes, dreams, and ideals about the shape and style of our personal lives is good. We know what we are aiming for. Also true: Having hopes, dreams, and ideals about the image of our personal life is a path straight to hell. Like this. Have you been in a home where there are well-displayed professional family photos; yet you know that the family is mostly unhappy? The photo communicates Norman Rockwell family sweetness, you know the family swims in stress, acrimony, and sadness. Why spend money on more professional photographs? Why not find classes, couples counseling, second opinions, support groups for whatever the family is dealing with, lawyer consultations if that is warranted, or maybe just a Saturday afternoon no-agenda family trip to a park. The sound of kids laughing and adults not arguing is real, the family photo on the wall is an image. What we are going to do when we “go out” this weekend. What our kids are going to do in their “free time”. How things “ought to look” is such a trap. Do we really think how something looks can tell us if we are happy or not? What do you want to hear? The Messiah chorus sung by three choirs with a backup symphony orchestra is amazing. Yes it is. But would it FEEL calmer to not buy tickets, not drive downtown, not dress up – and just listen to the Messiah chorus while you clean up after dinner every night for a week? What do you want to FEEL against your skin? That moment when you step outside and it is 12-degrees and the wind is howling – but you are wearing long underwear under your jeans, and your not-new winter jacket blocks the wind, and you can pull up its hood and snap it across your chin, and your boots are lined with fake fur – and you feel good. Or your house is chilly because you set the thermostat low, but there are two afghans and one cat on the sofa waiting for you. Or no one else wants to go out in the rainst but you have a waterproof coat with a hood, and you have boots, and you walk along a lake and the sound of the rain hitting the water is so awesome you laugh out loud. Most of us spend too much time, money, and energy arranging how things will look. If we slowed down and asked a few more questions could we could have less debt, more sense-rich adventures, more awareness of the people we love and like? More time alone on the sofa with afghans, books, cats, and donuts? If we ask good questions can we come up with a plan to, in a few years, transition from this job we don’t love to one we do? If we keep asking questions and paying attention, can we dive beneath our mild and horrible addictions, to find the bottlenecked creativity inside us? I had an extra persimmon so what to do? I found a cookie recipe, changed it a lot; they were (and six still are) so tasty. The secret to my persimmon cookies recipe is this. You don’t actually have to have a persimmon. Also I doubled amounts because I was giving them to friends who would be sharing with others, so I wanted there to be a lot. You can cut this down. See what I did there? It was supposed to be ALL persimmons, but I only had one so I added bananas. The cookies tasted like banana bread bites with edge-crunch from the Crisco. So you could just use old bananas and skip the persimmon. Hah. Here’s the deal. Put the Crisco in your mixing bowl. Add the sugar while letting your mixer beat at least two minutes. I chopped the persimmon small and added it to the sugar/Crisco. Then I added the bananas. Let all that beat until you can barely see fruit bits. Add the eggs. When this slurry is utterly whipped – add the dry ingredients. I usually put them all into the sifter while the mixer does its thing. I also microwaved the raisins in water for a minute to let them plump, but that’s just because I really like the people I was going to give them, too. Fancy steps, you know? Drop by small spoonfuls onto a lightly greased cookie sheets. Bake 11-13 minutes at 350-degrees. They are soft in the middle, crunchy on the edges. The best thing about them is not how they look but how they taste. Another great post. I agree! Thanks so much for your response. I remember Amy Dacyzyn suggesting folks look at the cost of something in terms of how many hours they would have to work to earn the money to pay for something. Years ago I worked at a retail store for $7.25/hr. I was daily tempted to buy their $4 hot pretzels... but would consider that half hour it would take to earn it... Yeps.